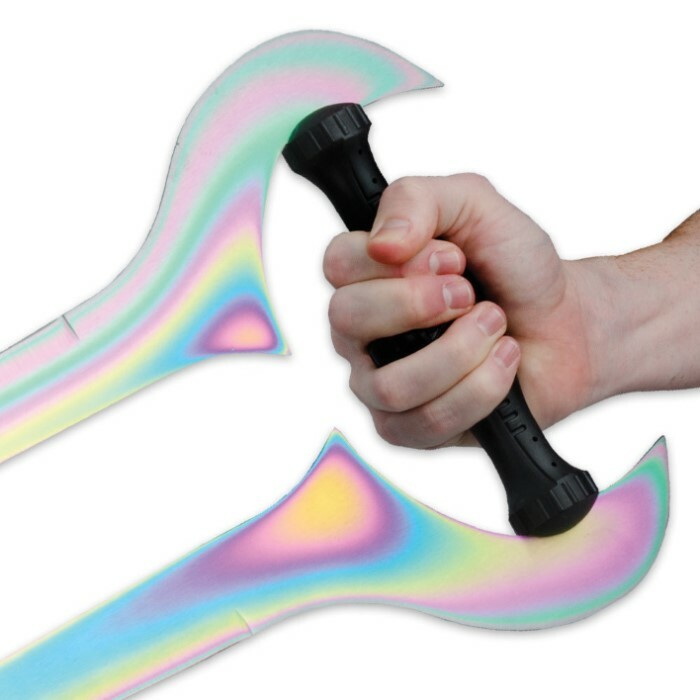 The ultimate close quarters melee weapon! The most noticeable feature are the two heat treated, Titanium color finish, 440 stainless steel blades. This special treatment, sometimes called "spectrum treatment", causes the colors to shift at different angles and lighting. This effect is similar to the blade effect seen in the video game series. 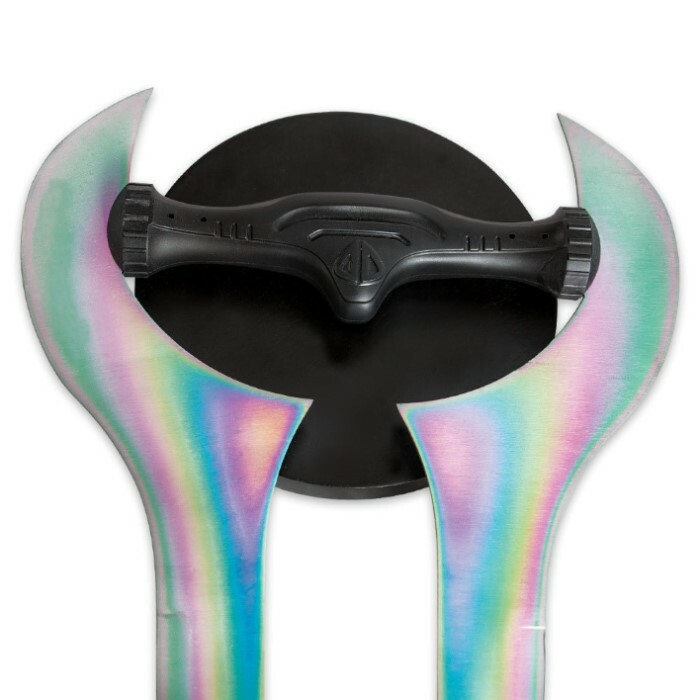 The blades will appear to be different colors depending on the amount of light and reflected colors they are around. The gray ABS material handle is produced with stunning attention to detail. Accurate in design and size, extremely unique, and well built. Easily one of the most unique and awesome swords in our collection. 27" overall length, 19 1/4" blades, 7" handle. First lets start with what is good, the sword is beautiful... And came with the wall plack. Great show sword. Now the bad. The sword arrived bent! Which is not to suprising the steel is extremly thin. Over all its an ok show sword but after some of my other purcheses from this company i was exceptionaly disappointed with the over all quality. Since it was meant to be a gift for a freind who will hang it on his wall it will be ok but i would not order one for my own collection. This is a beautiful replica and I'm glad to have it. The sword color is not as white /washed out as the picture shows. 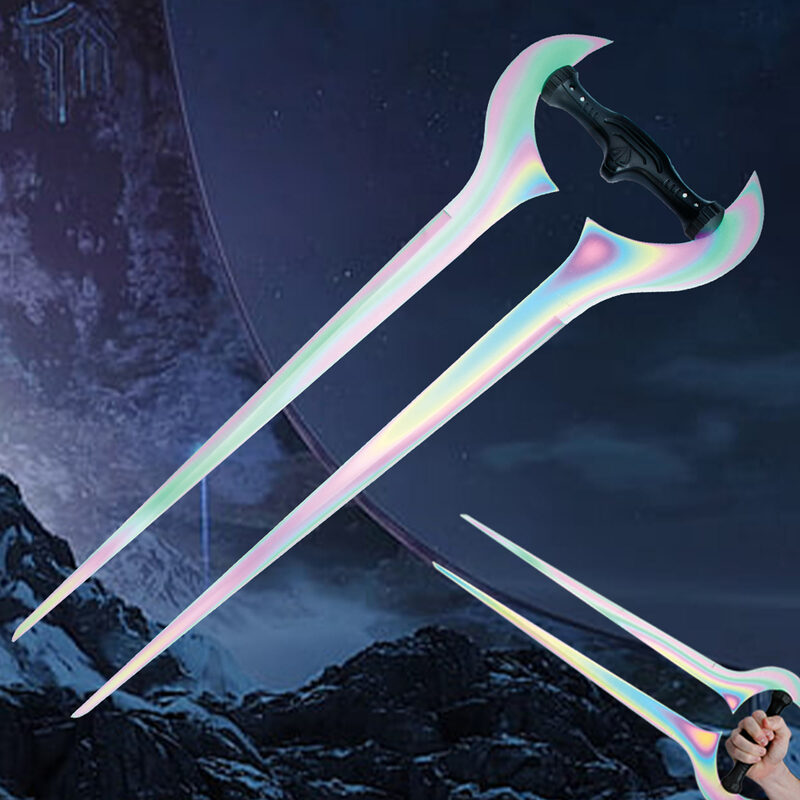 I think to get the best look, the sword should be displayed with light shining on it. It does come with a wall mount that will do the job. I think I might create something unique for such an Elite item. Plexiglas comes to mind. Got this awesome sword as an early Christmas from a friend. Looks splendid and I love how it feels when I carry it, but I give it four stars for the same reason Bryan from NY did, because it deserves to have its own wall mount. I mean come on, it would just not look right on a Celtic mount. BUDK you need to make a unique wall mount for this because the only wall mount I found was on Amazon and it comes along with a different looking Covenant Sword. This replica is AWESOME! I bought it for a friend who loves Halo. Once I took it out of the package and held it, I strongly considered buying one for myself. The only reason I gave this 4* was that I think it should come with a wall mount. It is uniquely shaped and needs to be displayed in the glistening sun, glowing in all of its plasma glory. Good product! Very sturdy handle, little bit smaller than it looks in the picture, blades are a bit wobbly, other than that you get exactly what you see! When I first received the sword, I was dissapointed to find that I had to put together the mount. I ended up putting it off center. But I don't mind because people are too busy admiring the amazing sword! The metal reflects the video game effects well! Because of the two blades, I would recomend using this as a decoration piece. Easily worth the $45! I am personally very satisfied with this. it's a little less sturdy than i would like, but it looks great and as a decorative piece its perfect. 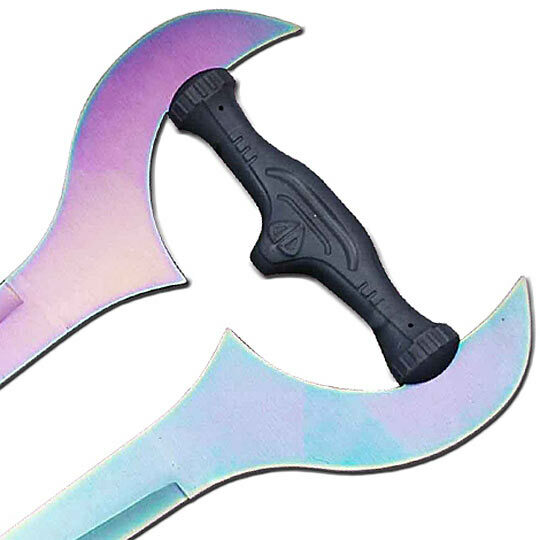 Don't expect to go dueling people in the streets with it, but its something that's certainly fun as hell to swing around making swishing noises to yourself or to feel like a badass when opening boxes. I bought this for my roomate, for xmas. It showed up earlier than expected, and packed securely. I'm very pleased, and he was very surprised! Thanks!